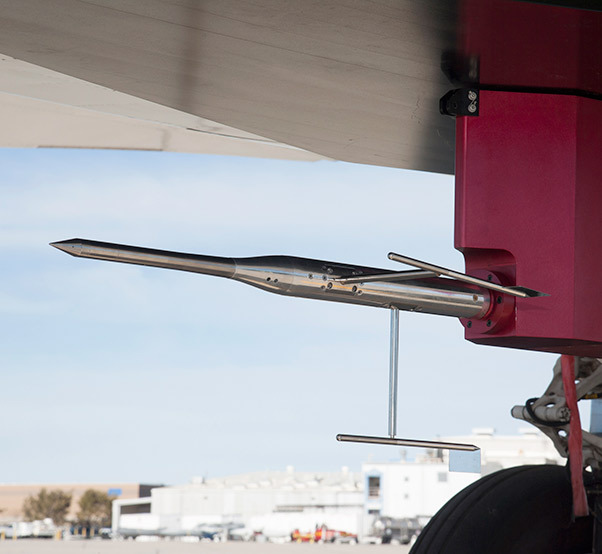 A new supersonic probe seen affixed to a F-15B flight test fixture might one day measure the sonic booms of a new generation of supersonic aircraft. 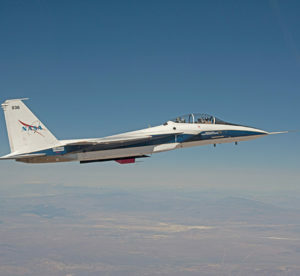 An air data probe intended to improve investigation of sonic booms is flying on the F-15B aircraft at NASA’s Armstrong Flight Research Center. 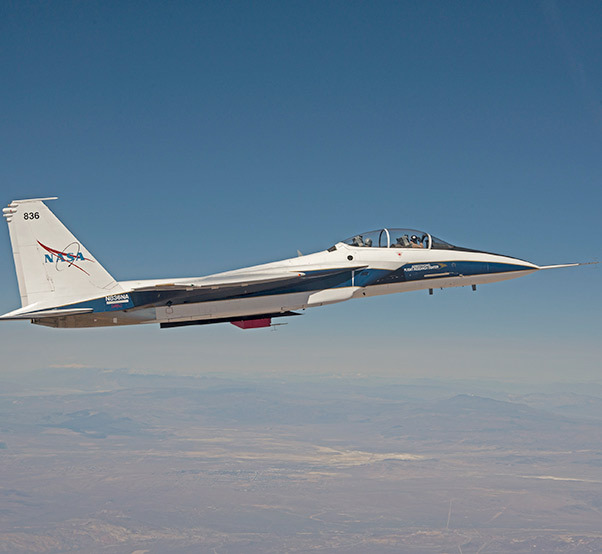 Calif.
NASA’s goal for sonic boom research is to find ways to control and lessen the noise from shockwaves so that federal regulators will allow commercial supersonic flight overland. The current six-flight series is set to continue through about mid-March, said Brett Pauer, F-15B project manager. Much like earlier flight tests in 2011 and 2014, the Eagle Aero Probe is flying on the F-15B’s test fixture called the centerline instrument pylon. The pylon is located under the aircraft’s fuselage. Researchers will be evaluating the performance of the probe originally developed by Eagle Aeronautics of Hampton, Va., and redesigned by NASA for this phase. The probe will be tested in a flight environment and the results will be compared with a traditional NACA-style probe that was flown on the centerline instrumented pylon in 2012. In addition to obtaining air data measurements underneath the F-15B, the probe will measure the strength of a shockwave generated from, as of yet, an undetermined part of the F-15B aircraft structure. 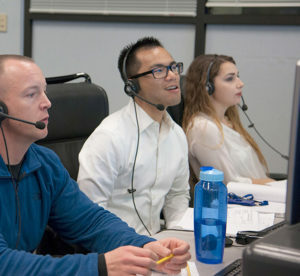 From left, Mike Frederick and NASA interns Jack Ly and Kassidy McLaughlin monitor a flight. A later phase of the testing will be to install the probe on either the nose of the F-15B, or on one of NASA’s F-15D aircraft based at Armstrong, Pauer said. The Eagle Aero Probe will replace the current nose boom during shockwave probing research flights, he added. The later flights will look at shockwaves generated by another nearby supersonic aircraft and are expected to obtain more accurate data than traditional probes, Pauer explained. Previous generations of the Eagle Aero Probes flew on the F-15B as part of a continuing effort that began as a NASA Research Announcement effort in 2009. The probes were tested in the Unitary Plan Wind Tunnel at NASA’s Langley Research Center in Hampton prior to flight research at NASA Armstrong. From the data obtained during this current flight phase, a key deficiency with the previous generations of the probe appears to be solved, Frederick said. A heater control system added into the probe keeps the pressure transducer temperatures stable at 150 degrees F, minimizing temperature effects on the pressure transducers and resulting in more accurate pressure measurements.